BACKGROUND: Pseudomonas aeruginosa is one of the most common causes of nosocomial infections. Carbapenems are widely used for the treatment of this microorganism, but nowadays, increasing number of carbapenem-resistant P. aeruginosa (CRPA) isolates are increasing which further lead to treatment failure due to associated multidrug resistance. AIM: The present study was done to determine the prevalence of New Delhi metallo-β-lactamase-1 (bla NDM-1) in P. aeruginosa in hospitalized patients in a tertiary care setup. SETTINGS AND DESIGN: The study was conducted in the department of microbiology with the tertiary care hospital settings. It was a prospective cross-sectional observational study conducted from June 2014 to December 2014. MATERIALS AND METHODS: Antibiotic susceptibility test was performed using Kirby–Bauer disc diffusion method for screening of the isolates. P. aeruginosa isolates with the zone diameter of carbapenems ≤18 mm were considered as carbapenemase producers. Metallo-beta-lactamases (MBL) detection was done using imipenem- ethylenediaminetetraacetic acid double-disc synergy test. NDM-1 gene in P. aeruginosa was identified using conventional polymerase chain reaction. STATISTICAL ANALYSIS USED: Chi-square test was used to analyze the data and P < 0.01 was considered statistically significant. RESULTS: Out of 460 P. aeruginosa, 74 (16.08%) isolates were CRPA. A total of 61 (13.2%) MBL-producing P. aeruginosa were isolated, and bla NDM-1 gene was detected in 18 (3.91%) P. aeruginosa isolates. CONCLUSION: The study showed increasing multidrug resistance among CRPA compared to carbapenem-sensitive P. aeruginosa. It also determined increasing prevalence of bla NDM-1 in P. aeruginosa isolates. It is emphasized to timely identify these pathogens and treat with proper antibiotics to reduce morbidity and mortality. There have been various mechanisms responsible for carbapenem resistance in P. aeruginosa such as carbapenemase enzyme production, decreased bacterial outer membrane permeability, and constitutive expression of efflux pump. The carbapenemase enzymes responsible are metallo-beta-lactamases (MBLs) such as IMP, VIM, NDM, and SPM and among the non-MBL enzymes are KPC, OXA, and GES types. NDM-1 gene has been most commonly isolated from Enterobacteriacae members but it is also recovered from nonfermenters such as Pseudomonas and Acinetobacter causing both community-acquired as well as hospital-acquired infections. Although the Prevalence of bla NDM-1 in P. aeruginosa is not that high compared to the fermenters, we have tried to highlight its prevalence and antimicrobial resistance pattern in our hospital setup. We have taken 460 nonduplicate P. aeruginosa which were obtained from various clinical samples including pus, sputum, various body fluids, wound swab, urine, and blood, received from inpatient departments of the hospital during June 2014 to December 2014 were included in the study. The study was performed after the ethical committee approval. All the clinical samples were received in the bacteriology laboratory of the microbiology department and processed. Pus, sputum, various body fluids collected in a sterile container, and wound swab were inoculated on sheep blood agar and MacConkey agar. Urine samples collected in a sterile universal container were inoculated on cysteine–lactose–electrolyte-deficient agar media. Blood samples collected in brain–heart infusion broth in a ratio of 1:5–1:10 (blood to broth) were incubated overnight at 37°C and then subcultured on sheep blood agar and MacConkey agar. Inoculated media were incubated aerobically at 37°C for 16–24 h.
The culture plates were examined for the growth after incubation and were processed further for identification. P. aeruginosa was identified on the basis of colony morphology, pigment production, Gram's staining, catalase, oxidase, standard biochemical tests, and growth on cetrimide agar. Isolates were first screened for the production of carbapenemase. The screening was done by disk diffusion method using imipenem 10 μg disk (HiMedia). A lawn culture of 0.5 McFarland standard suspension prepared from the isolate to be tested was done on Mueller–Hinton agar (MHA, HiMedia), and imipenem disk was applied on the surface of agar and incubated aerobically at 37°C for 16–18 h. The zone of inhibition ≤18 mm was considered indicative of carbapenemase production as per the Clinical and Laboratory Standard Institute (CLSI) 2014 guidelines. Quality control strain used for the test was P. aeruginosa ATCC 27853 and Escherichia More Details coli ATCC 35218 (for β-lactam/β-lactamase inhibitor combinations). Imipenem-ethylenediaminetetraacetic acid (EDTA) double-disk synergy test was used to determine carbapenemase production in P. aeruginosa. A 0.5 McFarland suspension of test isolate was inoculated in an MHA plate and two imipenem 10 μg disks were placed on the surface of agar. About 5 μl of 750 μg EDTA solution was applied over one imipenem disk. After 16–18 h of aerobic incubation at 37°C, the plate was examined for the zone of inhibition around imipenem and imipenem-EDTA disks. A difference in the zone of inhibition >7 mm between the two disks was considered as carbapenemase producer. Antimicrobial susceptibility testing of all the isolates showing carbapenemase production by phenotypic method was determined by Kirby–Bauer disk diffusion method on MHA as per the CLSI 2014 guidelines. The antibiotics used were (potency in μg/disk, HiMedia) ceftazidime (30), gentamicin (10), tobramycin (10), piperacillin (100), ticarcillin (75), amikacin (10), aztreonam (30), cefepime (30), piperacillin-tazobactam (100/10), ticarcillin-clavulanate (75/10), ciprofloxacin (5), levofloxacin (5), norfloxacin (10), doripenem (10), imipenem (10), meropenem (10), colistin (10), and Polymyxin B (300 units). DNA was extracted from the isolates by Real Genomics DNA Extraction kit (version 2013-1, RBC Bioscience Ltd.). Polymerase chain reaction (PCR) of the extracted DNA was performed to determine the New Delhi metallo-β-lactamase-1 (bla NDM-1) gene in the carbapenemase-producing P. aeruginosa isolates. Primers used for amplification of the gene which amplified an internal fragment of 621 bp of the bla NDM-1 gene as depicted in [Table 1]. The amplification of DNA was performed in Applied Biosystems thermocycler with a final volume of 25 μl. The PCR conditions for the amplification of gene were denaturation at 94°C for 10 min, 36 cycles of amplification at 94°C for 30 sec, 54°C for 40 s, and 72°C for 50 s and final extension at 72°C for 5 min. 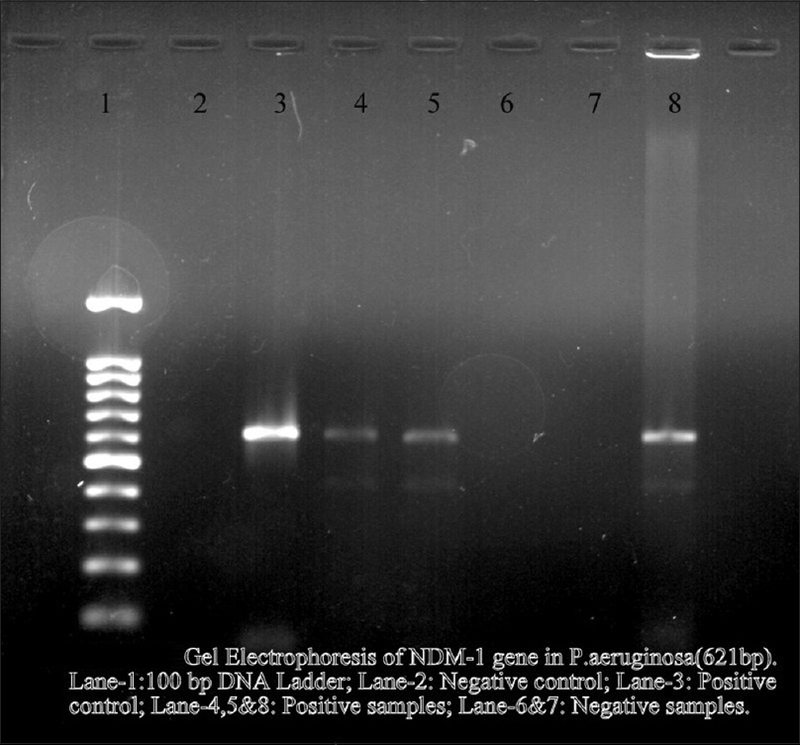 The amplified DNA products were visualized by Gel Electrophoresis using 1% (w/v) agarose gel in 1x TBE (1.0M Tris/0.9M Boric acid/0.01M EDTA) with 0.05 mg/lt ethidium bromide [Figure 1]. This was a prospective cross-sectional study conducted in the Department of Microbiology, Hind Institute of Medical Sciences, Barabanki, Uttar Pradesh, India. Ethical committee approval was taken before the study and informed consent was obtained from patients. The results were recorded in a Microsoft Excel sheet and were statistically analyzed. Chi-square test was used to analyze the data. P < 0.01 was considered as statistically significant. A total of 460 isolates of P. aeruginosa were obtained from various clinical samples such as urine (258), sputum (95), blood (43), pus (39), and body fluids (25). 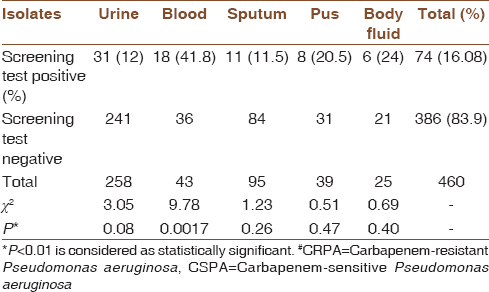 Among the different clinical samples, carbapenem-resistant P. aeruginosa (CRPA) was mostly found in blood samples (41%; 18/43), followed by other samples which was statistically significant (P < 0.01) [Table 2]. The present study showed 74 CRPA among 460 samples constituting 16.08%. All the CRPA isolates were subjected to IMP-EDTA double-disk synergy test for MBL detection, where 61 isolates were positive with the test. Out of these, 18 isolates were bla NDM-1 positive [Table 3]. We have performed antibiotic sensitivity by Kirby–Bauer disk diffusion method, which showed that carbapenemase-producing isolates were completely resistant to ceftazidime (100%) and aztreonam (100%), above 50% resistant to β-lactams such as piperacillin (97.3%), ticarcillin (95.9%), ticarcillin-clavulanate (68.9%), cefepime (58.1%), and piperacillin-tazobactam (55.4%). Among aminoglycosides, there was higher resistance to gentamicin (79.7%) compared to tobramycin (56.7%) and amikacin (54%). Fluoroquinolones were highly resistant such as ciprofloxacin (91.1%), levofloxacin (77%), and norfloxacin (82.4%) in urine isolates. All the isolates were completely sensitive to colistin and polymyxin B [Figure 2]. Carbapenem resistance is emerging rapidly in nonfermenters such as P. aeruginosa. In our study, we have seen 16.08% (74/460) CRPA isolates. In South India, 12% carbapenem resistance was reported in Karnataka and 28.8% in Chennai in a study of Shanthi et al. A study in Taiwan showed 10% CRPA, that is, 349 out of 3408 samples. P. aeruginosa is one of the most common causes of hospital-acquired infections; hence, it is important to identify these CRPA from different sources to optimize treatment and reduce the morbidity and mortality. The prevalence of CRPA was highest in bloodstream infections (41.8%; n = 18/43), followed by other samples. This was statistically significant with P < 0.01. In a study by Meradji et al., infections caused by P. aeruginosa were the skin, surgical site, and soft-tissue infection (70%), followed by lower respiratory tract infection (17.5%), urinary tract infection (11.25%), and bloodstream infection (1.25%) as per the anatomical location. We have found that three patients expired among the CRPA cases followed, of which, two cases were bla NDM-1 positive. The mortality rate was 0.6% (3/460) among the patients infected with P. aeruginosa during the study period. NDM-1 gene was first identified in Klebsiella spp. in India in 2009, later in other members of Enterobacteriaceae. NDM-1 gene was first reported in 2011 in P. aeruginosa in Serbia, till that time no study was reported on NDM-1 in P. aeruginosa. In 2013, both Shanthi et al. from South India and Khajuria et al. from Pune reported four NDM-1 genes positive in P. aeruginosa., Subsequently, from Italy in the same year 2013, NDM-1 gene in P. aeruginosa was first reported, patient was previously hospitalized in Serbia. Then, in 2014, two cases of NDM-1 in P. aeruginosa were detected in Egypt, they had no history of travel to India or Europe. In Singapore, the first case was reported from Southeast Asia in 2015. Nowadays, MBL-producing isolates are increasing worldwide and are commonly associated with infections in hospital setup. The present study has reported 13.2% (61/460) MBL production in P. aeruginosa isolates. A study by Navaneeth et al. reported 12% MBL in P. aeruginosa. Out of 74 CRPA, our study reported 61 MBL using IMP-EDTA disk test. We have not performed modified Hodge test (MHT) as the CLSI does not recommend the use of it for P. aeruginosa. However, some studies like Shanthi et al. have performed MHT using meropenem disk.,, MBL detection from CRPA in our study was 82.4% (n = 61/74) which is close to 90% (n = 110/122) from imipenem-resistant P. aeruginosa in a study from Iran and higher than Polotto et al., a Brazilian study which has detected 31.4% (n = 17/54) MBL from imipenem-resistant P. aeruginosa., A study by Irfan et al. in Pakistan showed 100% MBL positive by IMP-EDTA disk test in imipenem-resistant P. aeruginosa. The present study documented 18 bla NDM-1 among 61 MBL-producing P. aeruginosa. A total of 43 MBL-producing isolates which were negative for bla NDM-1 may have other genes present such as bla VIM, bla IMP, or bla SIM. We have limited our study to bla NDM-1 detection using conventional PCR therefore, we cannot comment on other genes. As reported from various studies in India, bla VIM is the most common MBL gene among P.aeruginosa isolates followed by other genes including bla NDM-1., Amudhan et al. have reported 55.7% bla VIM and 3.3% bla IMP gene among carbapenem resistant P.aeruginosa isolates and another study showed 13.3% bla VIM and 1.3% bla IMP from multidrug resistant P.aeruginosa. Although the prevalence of bla NDM-1 is relatively low in Pseudomonas, still this figure is important due to multidrug resistance among these isolates. Along with β-lactams, the CRPA strains are also resistant to other groups of antibiotics such as aminoglycosides and fluoroquinolones. This study has noticed that resistance pattern in these CRPA is higher as compared to carbapenem-sensitive P. aeruginosa isolates. These strains are completely sensitive to colistin and polymyxin B in our study similar to the study by Ramakrishnan et al. from Puducherry. In addition, Carattoli et al. and Lin et al. showed 100% sensitivity to colistin, whereas Shanthi et al. showed 100% sensitivity to polymyxin B.,, Tigecycline, in effective in Acinetobacter but not in Pseudomonas. Hence, we are left with limited antibiotics of choice for treatment of CRPA. Due to increasing multidrug resistance in P. aeruginosa and its nosocomial nature, it is becoming a great threat to the world of antimicrobials. Although we have colistin and polymyxin B sensitivity to CRPA, these can never be the first-line drugs due to toxicity; therefore, we have to judiciously use the antibiotics to prevent drug resistance and should make an effort to generate an antibiotic policy in the hospital which will help the clinicians to choose the appropriate drug for empirical treatment. There are tests available such as carbaNP test which can be used to detect carbapenemase production at places where the molecular diagnostic facilities are not available. It is a simple and rapid test which can be performed even by laboratory technicians and can help in infection control. The need of hour is to timely identify the drug-resistant pathogens and treat them with proper antibiotics effectively to reduce the morbidity and mortality and also to prevent their spread in the community. Mesaros N, Nordmann P, Plésiat P, Roussel-Delvallez M, Van Eldere J, Glupczynski Y, et al. Pseudomonas aeruginosa: Resistance and therapeutic options at the turn of the new millennium. Clin Microbiol Infect 2007;13:560-78. Carattoli A, Fortini D, Galetti R, Garcia-Fernandez A, Nardi G, Orazi D, et al. Isolation of NDM-1-producing Pseudomonas aeruginosa sequence type ST235 from a stem cell transplant patient in Italy, may 2013. Euro Surveill 2013;18. pii: 20633. Lin KY, Lauderdale TL, Wang JT, Chang SC. Carbapenem-resistant Pseudomonas aeruginosa in Taiwan: Prevalence, risk factors, and impact on outcome of infections. J Microbiol Immunol Infect 2016;49:52-9. Lister PD, Wolter DJ, Hanson ND. Antibacterial-resistant Pseudomonas aeruginosa: Clinical impact and complex regulation of chromosomally encoded resistance mechanisms. Clin Microbiol Rev 2009;22:582-610. Hong DJ, Bae IK, Jang IH, Jeong SH, Kang HK, Lee K, et al. Epidemiology and characteristics of metallo-β-lactamase-producing Pseudomonas aeruginosa. Infect Chemother 2015;47:81-97. Meradji S, Barguigua A, Zerouali K, Mazouz D, Chettibi H, Elmdaghri N, et al. Epidemiology of carbapenem non-susceptible Pseudomonas aeruginosa isolates in Eastern Algeria. Antimicrob Resist Infect Control 2015;4:27. Mataseje LF, Peirano G, Church DL, Conly J, Mulvey M, Pitout JD, et al. Colistin-nonsusceptible Pseudomonas aeruginosa sequence type 654 with blaNDM-1 arrives in North America. Antimicrob Agents Chemother 2016;60:1794-800. Forbes BA, Sahm DF, Weissfeld AS. Bailey & Scott Diagnostic Microbiology. 12th ed. USA: Elsevier Science Health Science Div; 2007. Clinical and Laboratory Standards Institute, Performance Standards for Antimicrobial Susceptibility Testing; Twenty-Fourth Informational Supplement. M100-S24. Wayne, PA: Clinical and Laboratory Standards Institute; 2014. Yong D, Lee K, Yum JH, Shin HB, Rossolini GM, Chong Y, et al. Imipenem-EDTA disk method for differentiation of metallo-beta-lactamase-producing clinical isolates of Pseudomonas spp and Acinetobacter spp. J Clin Microbiol 2002;40:3798-801. Nordmann P, Poirel L, Carrër A, Toleman MA, Walsh TR. How to detect NDM-1 producers. J Clin Microbiol 2011;49:718-21. Navaneeth BV, Sridaran D, Sahay D, Belwadi MR. A preliminary study on metallo-beta-lactamase producing Pseudomonas aeruginosa in hospitalized patients. Indian J Med Res 2002;116:264-7. Shanthi M, Sekar U, Kamalanathan A, Sekar B. Detection of new Delhi metallo beta lactamase-1 (NDM-1) carbapenemase in Pseudomonas aeruginosa in a single centre in southern India. Indian J Med Res 2014;140:546-50. Yong D, Toleman MA, Giske CG, Cho HS, Sundman K, Lee K, et al. Characterization of a new metallo-beta-lactamase gene, bla(NDM-1), and a novel erythromycin esterase gene carried on a unique genetic structure in Klebsiella pneumoniae sequence type 14 from India. Antimicrob Agents Chemother 2009;53:5046-54. Jovcic B, Lepsanovic Z, Suljagic V, Rackov G, Begovic J, Topisirovic L, et al. Emergence of NDM-1 metallo-β-lactamase in Pseudomonas aeruginosa clinical isolates from Serbia. Antimicrob Agents Chemother 2011;55:3929-31. Khajuria A, Praharaj AK, Kumar M, Grover N. Emergence of NDM- 1 in the clinical isolates of Pseudomonas aeruginosa in India. J Clin Diagn Res 2013;7:1328-31. Zafer MM, Amin M, El Mahallawy H, Ashour MS, Al Agamy M. First report of NDM-1-producing Pseudomonas aeruginosa in Egypt. Int J Infect Dis 2014;29:80-1. Teo JW, La MV, Jureen R, Lin RT. Emergence of a New Delhi metallo-β-lactamase-1-producing Pseudomonas aeruginosa in Singapore. Emerg Microbes Infect 2015;4:e72. Lee K, Lim YS, Yong D, Yum JH, Chong Y. Evaluation of the Hodge test and the imipenem-EDTA double-disk synergy test for differentiating metallo-beta-lactamase-producing isolates of Pseudomonas spp. And Acinetobacter spp. J Clin Microbiol 2003;41:4623-9. Miriagou V, Cornaglia G, Edelstein M, Galani I, Giske CG, Gniadkowski M, et al. Acquired carbapenemases in gram-negative bacterial pathogens: Detection and surveillance issues. Clin Microbiol Infect 2010;16:112-22. Moosavian M, Rahimzadeh M. Molecular detection of metallo-β-lactamase genes, bla IMP-1, bla VIM-2 and bla SPM-1 in imipenem resistant Pseudomonas aeruginosa isolated from clinical specimens in teaching hospitals of Ahvaz, Iran. Iran J Microbiol 2015;7:2-6. Polotto M, Casella T, de Lucca Oliveira MG, Rúbio FG, Nogueira ML, de Almeida MT, et al. Detection of P. Aeruginosa harboring bla CTX-M-2, bla GES-1 and bla GES-5, bla IMP-1 and bla SPM-1 causing infections in Brazilian tertiary-care hospital. BMC Infect Dis 2012;12:176. 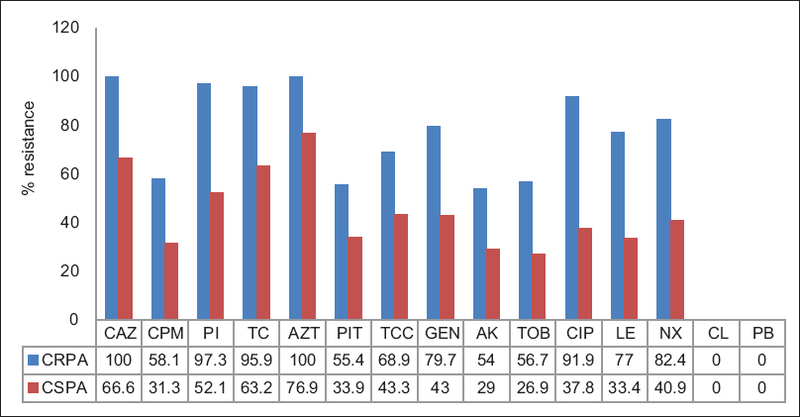 Irfan S, Zafar A, Guhar D, Ahsan T, Hasan R. Metallo-beta-lactamase-producing clinical isolates of Acinetobacter species and Pseudomonas aeruginosa from Intensive Care Unit patients of a tertiary care hospital. Indian J Med Microbiol 2008;26:243-5. Amudhan MS, Sekar U, Kamalanathan A, Balaraman S. Bla(IMP) and bla(VIM) mediated carbapenem resistance in Pseudomonas and Acinetobacter species in India. J Infect Dev Ctries 2012;6:757-62. Ramakrishnan K, Rajagopalan S, Nair S, Kenchappa P, Chandrakesan SD. Molecular characterization of metallo β-lactamase producing multidrug resistant Pseudomonas aeruginosa from various clinical samples. Indian J Pathol Microbiol 2014;57:579-82. Mehrad B, Clark NM, Zhanel GG, Lynch JP 3rd. Antimicrobial resistance in hospital-acquired gram-negative bacterial infections. Chest 2015;147:1413-21.